Do we have free will or are our actions completely determined by a chain of causes? Nicolas Vale answers this perennial question unequivocally. He asserts that free will is an illusion. All of our actions and thoughts are entirely predetermined, with no “free” element in them at all. We are like computers, programmed by heredity and environment, posits Vale. In pursuing pleasure and fleeing pain, we make the best possible choices available to us at the moment. Vale holds that the world would be better off without the notion of free will. 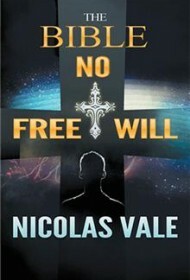 Claiming that his work is “a new kind of Bible,” Vale crusades against the “myth” of free will. The pseudo-biblical structure of the book is confusing. Divided into books, chapters and verses, Vale assigns most of the work to pseudonymous authors called, for example, “The Gifter” or “The Reality Teller.” However, it is evident that Vale is the author of it all. The conceit of pseudonymous authors is an eccentricity that hinders comprehension. Vale takes an unnecessarily strident tone that is off-putting. For instance, he begins the book by declaring that the belief in free will is “nonsense,” ridiculing it elsewhere as “complete, utter insanity.” It would be more effective for Vale to lead readers to his truth by presenting a pattern of evidence, without the dismissive rhetoric. Further, the author doesn’t distinguish between the acceptance of the truth of the idea of free will and the way that acceptance might make someone feel. Vale argues that “free will” is a harmful notion because those who believe they are the cause of their own failures inevitably feel bad about themselves. But this emotional reaction isn’t a necessary result of the acceptance of free will. At bottom, Vale’s book is a series of strong assertions with occasional forays into reasoned argument. Ultimately, his new Bible does not make its case.